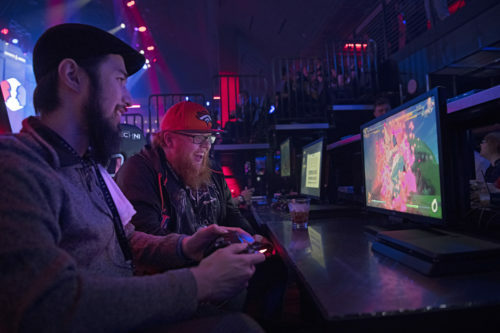 LAS VEGAS — Esports Arena Las Vegas, the first dedicated esports venue on the Strip, opened its doors at Luxor Hotel and Casino on March 22, 2018. It is the flagship venue of Allied Esports’ global property network spanning North America, Europe and China. The state-of-the-art arena, featuring a multi-level modular design with a two-story LED video wall, telescopic seating and a world-class production facility, is a ready-to-go championship destination and content studio for publishers, leagues, tournaments and high-stakes matchups in a setting designed to deliver an unparalleled live fan experience. The esports and entertainment venue, which also includes a one-of-a-kind food and beverage offering from Chef José Andrés and ThinkFoodEntertainment, an active virtual reality station, a classic video game bar and an interactive history of video gaming display, is open daily for walk-up play and features nightly competitions across all gaming communities. With a total of 30,000-square feet, Esports Arena Las Vegas consists of three connected spaces: the Main Hall, featuring the main competition stage, gaming stations, a two-story video wall, upper- and lower-level VIP rooms, two bars, and production facilities; The Dome, which houses an interactive history of gaming display, a 360-degree videoboard, and a one-of-a-kind gaming inspired chandelier; and the Front Lobby, featuring additional gaming stations, a streaming booth and a virtual reality experience. Esports Arena Las Vegas will begin standard operating hours on Monday, March 26 at noon.